​Details on each course, along with sample syllabi are provided below. Participatory research integrates the translation of knowledge into practice by generating evidence that emanates from the setting or practice where it will ultimately be applied, making it much more relevant to end-users such as health care providers, patients and their care-givers, service managers, community organisations and other stakeholders. 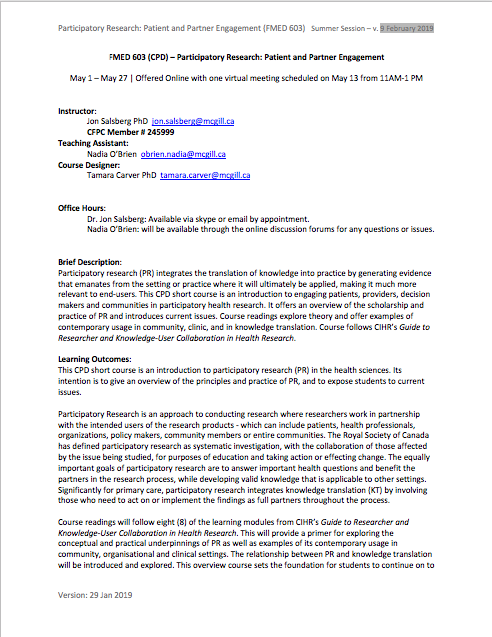 This introductory professional interest course will follow the Canadian Institutes of Health Research Guide to Researcher and Knowledge-User Collaboration in Health Research, with a particular emphasis on its application in primary care and community health. Please visit https://www.mcgill.ca/familymed/education/graduate-programs/summer-session for further details and information on how to register. This Level 9 module is offered online through the University of Limerick (Ireland) for 3 ECTS credits. You should contact your home university’s graduate office for details on how to register for external credit courses. 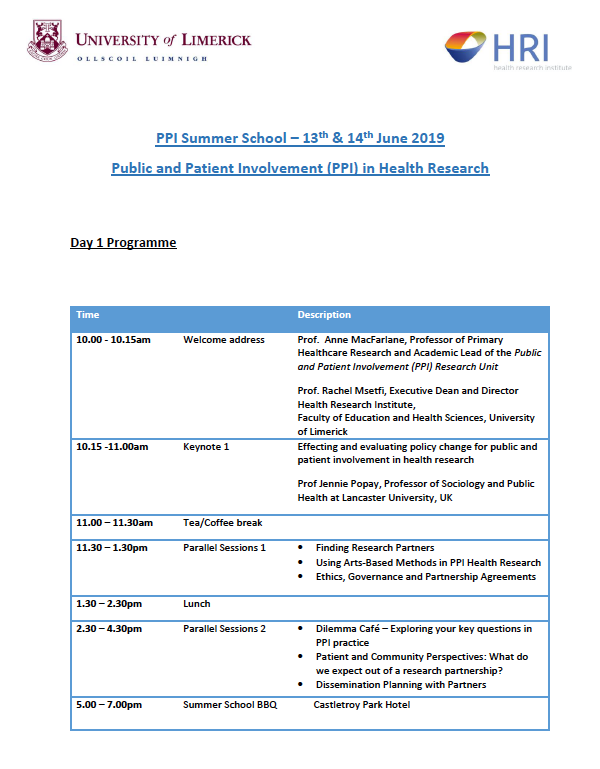 The 4th Annual Public & Patient Involvement Summer School is a one-and-a-half day immersive series of workshops, lectures and networking opportunities. 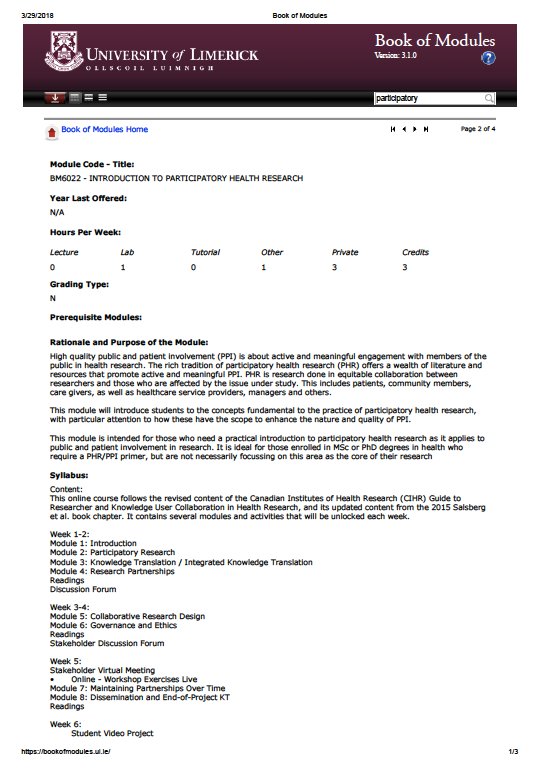 It is aimed at students, researchers, health providers and decision makers, or anyone who needs an introduction to patient and community-engaged health research; or those who need further guidance in specific participatory activities. Workshops cover topics such as, finding and engaging with research partners; collaborative grant development, data analysis and dissemination planning; ethics; and methods such as participatory learning in action. Workshops are jointly facilitated by academic and community co-facilitators. Please save the date! Further details and list of invited speakers and facilitators will be announced shortly. Limited small travel scholarships will be available for community-based participants.